Despite the late date, early-ice conditions prevail through much of the Ice Belt, so take the safety precautions you practiced last December – sleep late, travel light and carry the right Rapala tools. Made from welded steel and featuring a foam-coated handle for grip and shock resistance, Rapala’s two-piece 62-inch Chisel is great for both checking ice safety and re-opening holes. When venturing out onto a frozen lake for the first time, thrust your chisel into the ice ahead of you with every step, to check for thickness. If the ice cracks, or the chisel breaks through, turn back, you are not in a safe spot. Throughout the early-ice season, Holst wears Rapala Ice Safety Spikes around his neck to ensure they’re easily accessible. That means leaving most of your gear on shore when you walk onto the ice for the first time. This cuts down on weight and allows you move quietly. Pulling your sled could create noise that might prevent you from hearing warning signs. “If I need to retreat, I want to be able to beat feet and reverse very quickly,” Holst says. 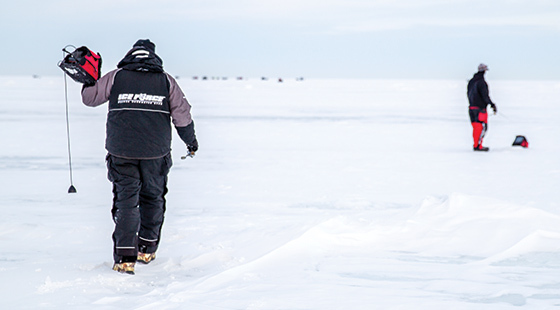 Although walleyes generally bite best early in the morning and late in the day, don’t step onto early-season ice for the first time in the dark. Wait until after first-light to fish early ice. The cover of darkness can mask dangerous cracks and soft spots. Instead of embarking before daybreak to fish an early-morning low-light bite, set out for the first time in full daylight and mark a safe route to your fishing spot (physically, and via a GPS track) that you can follow back safely to shore after fishing the dusk low-light bite. PFD – Never set foot on new ice for the first time without wearing a personal flotation device (PFD). Carrying throwable flotation devices is not sufficient. Buddy System/Rope – Always travel with a friend. One of you should walk a significant distance behind the other and carry a 100-foot rope. On both ends of the rope, tie a loop (but not a slip knot – preferably a bowline knot) large enough for a person to slip over his shoulders and under his armpits. A person can pull with more power with the rope around their body than just pulling with their arms. The person in the water should slip into the loop, if possible. Cold hands and shock from cold water can make it harder to hold onto a rope; should the person become weak, or pass out, a rope under their armpits can help a rescuer pull them out regardless. Distribute Your Weight – If the ice does begin to crack, quickly get down on your hands and knees – or even lay down on the ice – to distribute your weight. Then slowly crawl back in the direction you’ve just come. Share Your Travel Plan – Set, stick to, and share with a spouse, significant other, friend or family member a travel plan – where you will be fishing, where you will park, and when you will get off the ice – and immediately call them to report your return to safe ground. Request that they come looking for you – or contact the authorities – if you do not call close to the appointed time. Use the same person every trip and never forget to call. You don’t want your person to think you forgot to call and assume that you are safe. That person could be your last chance at rescue.